Background: α-Glucosidase inhibitors (AGIs) have been reported for their clinical potential against postprandial hyperglycemia, which is responsible for the risks associated with diabetes mellitus 2 and cardiovascular diseases (CVDs). Besides, a number of compounds have been reported as potent AGIs, several side effects are associated with them. Methods: The aim of present work is to explore new and potent molecules as AGIs. Therefore, a library of dibenzoazepine linked triazoles (1-15) was studied for their in vitro α-glucosidase inhibitory activity. The binding modes of potent compounds in the active site of α-glucosidase enzyme were also explored through molecular docking studies. Results and Conclusion: Among the reported triazoles, compounds 3-9, 11, and 13 (IC50 = 6.0 ± 0.03 to 19.8 ± 0.28 µM) were found to be several fold more active than the standard drug acarbose (IC50 = 840 ± 1.73 µM). Compound 5 (IC50 = 6.0 ± 0.03 µM) was the most potent AGIs in the series, about 77- fold more active than acarbose. 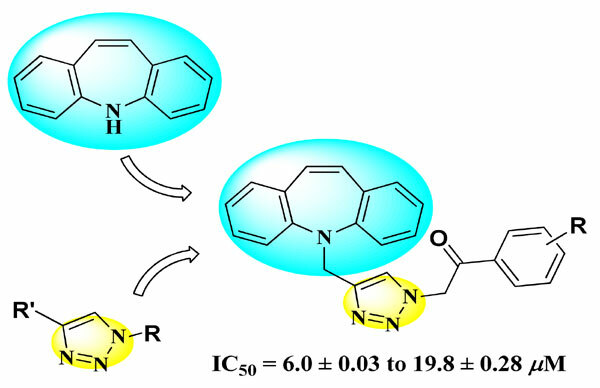 Therefore, dibenzoazepine linked-triazoles described here can serve as leads for further studies as new non-sugar AGIs. Acetophenones, diabetes, dibenzoazepine, molecular docking, triazoles, α-glucosidase.